I have learned that my particular affliction with Product Acquisition Syndrome seems worst when I have the least money (like now). Get the Barracuda unless you want to import that Dingo thing so I can get a look at it. I started with a Renzetti Traveler, have added onto it over the years (cam, saltwater upgrade, Clouser arm, parachute arm) and still use it whenever I travel with a vise. Well…I have the Renzetti traveller and its hanging in there with the cam jaws and I too considered the Dingo and Dyna King. I’ve only heard good things about the Dingo Zach. What I would warn you away from would be the Vosseler. It has the suction base but the hook holding design is flawed and not user friendly when production tying. I’ve been tying flies commercially for 23 years now, on Dyna King. 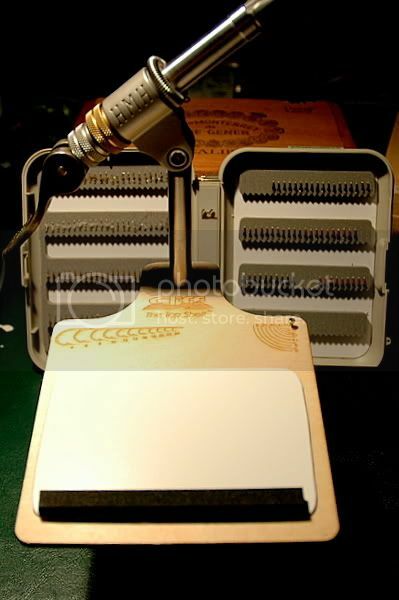 My first Dyna King was a Prince which did around 100,000 flies or so before I decided to on-sell it to get a vice with an adjustable head angle. I bought the Dyna King Professional 3 years ago and haven’t looked back. I tried an early version of the Dingo and thought it was a dog. (sorry, couldn’t resist the pun!). But seriously, I don’t think the Dingo is in the same league as the Dyna King. Are you talking about the Griffin Mongoose? Would you want to sell your old Renzetti? I don’t tie a lot,but for what it’s worth I have a Griffin Mongoose and have found it a well made bit of kit.A mate who ties for a living has used a Griffin for years and had no problems. Yuhina, I use the Traveller, too, but I tend to only tie BIG stuff with it. I’ve had no issues with sizes 12 through 3/0. Mine is a C-clamp, which is nice when I’m cranking down hard on big salt water patterns. I’m sure there are better vices out there, but I feel like it was a good value for the money. No complaints. For me the Dynaking professional is the vise for serious tying (at home, at shows, large numbers). * It holds the hook well, both delicate Catskill dry flies (http://www.danica.com/flytier/jlee/light_hendrickson.htm) as well as serious deer hair bugs like the Dahlberg divers (http://bassbug.blogspot.com/2007/03/tying-bassbugs.html). * Gives me fully operate to turn the fly with ease for inspecting, easy access, etc. For traveling the Dynaking is just too big & heavy. Over the years I’ve had in my possession or tried vises from Thompson, Griffin, Renzetti, and HMH. Until recently I thought I had found my last vise in the HMH spartan. It’s a very good vise. But then a couple of years ago a friend of mine that owns our local fly shop let me try a Peak vise. After tying a few flies on it I was sold. I dumped (sold) the HMH and bought one. What do I like about the Peak vise? Pretty much everything – It’s rock solid, very smooth rotary action. and a “positive stop” cam lever. It has different sized jaws available (for extra $$) but I haven’t needed them. I tie #6’s down to #22’s and it holds all of that range rock solid with very little adjustment needed even when going from a #10 to a #20. The only thing I didn’t like about it were some of the plastic/delrin screws. But Peak sells a brass screw upgrade (just a few bucks) so that’s not really and issue. It’s even relatively inexpensive compared to other similar true rotary vises. I would have paid twice the price though and still considered it a bargain. But then a couple of years ago a friend of mine that owns our local fly shop let me try a Peak vise. After tying a few flies on it I was sold. It’s only been mentioned once so far…but I have the HMH Spartan and it is a great no frills vise. I also use a HMH Spartan. I really like it. I have tied #22 to 1/0 flies on it with no trouble. I spin deer hair on it and don’t need any Clouser arms. It just works. The accessories I have added is a bobbin holder arm thingy. The only thing I recently was a Cliff’s Outdoor Top Shelf, which can be used with any vise. What a great place to keep hooks and flies you’ve tied in order until they make it into the fly box. Hey, that’s a neat little device Cameron! 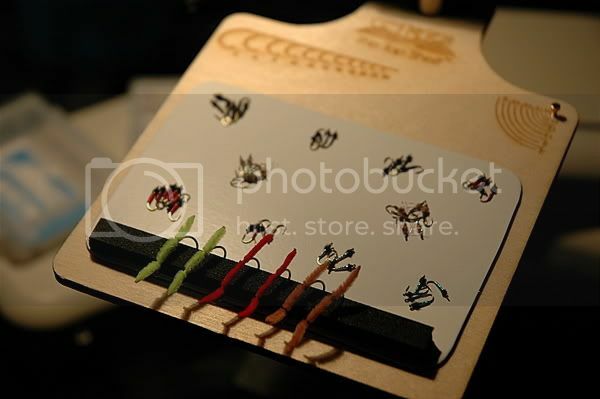 That is nice photography of your fly vise, your depth of field is good and lighting works well.